Yesterday Morning, I attended what I believe was the fourth installment of Representative Karen Bass’ Africa Policy Breakfast Series at the Library of Congress. This session focused on ‘Power: Eliminating a Barrier to Trade, Development and Growth in Africa.’ It featured representatives from Symbion Power, a key player in Obama’s new Power Africa Initiative, the Millenium Challenge Corporation (MCC), and a Nigerian power official. Congressman Edward Royce gave opening remarks and Ms. Oren Whyche-Shaw, Principal Adviser to USAID’s Assistant Administrator for Africa, moderated. 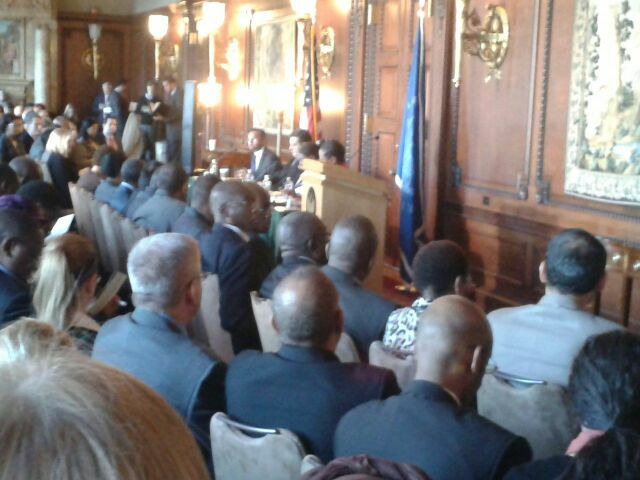 Power Africa has really gained traction in the DC policy community. I have covered several events on it at CSIS (one of which also featured Symbion Power), expressed my concern about a scheduled DoD event on Power Africa, and it even came up at a previous Breakfast Series. I’ll confess to a bit of Power Africa fatigue, but I shouldn’t really go there because the need is great and I’m also one of the first to criticize people (especially in development) for lacking a focus on issues. The African diplomatic corps certainly doesn’t seem fatigued by Power Africa – or at least those from Francophone Africa. It was noted that the Ambassadors of Benin, the Democratic Republic of the Congo, Burkina Faso, Guinea, Niger, Cameroon, the Central African Republic, and Senegal were in attendance. Representing the Anglophones were South Sudan, Tanzania, Swaziland, Sierra Leone, and Uganda. Mauritius and Ethipoian ambassadors were also present. I arrived at the end of Congressman Royce’s remarks; I managed to hear him articulate the need for greater access to power in Africa in general and he cited the potential of the Congo River in particular. Adviser Shaw noted that ‘Africa is on the brink of an expansive economic growth period’ but that improvements to the power supply are necessary for this expansion to reach its true potential. In the Q&A, in response to a question by the head of the US Africa Development Foundation, who herself has been making the rounds to promote Power Africa, she noted that the initiative has ‘significant ambition in off grid, renewable energy’. Presumably, the sort of energy that can immediately benefit rural Africans. Kamran Khan of the MCC noted the importance of growth for security and the importance of electricity for growth. Befitting an official of the MCC, an organization which rewards good governance, he spoke of the need to have our trade partners in Africa adopt the core principles that the US believes in. I thought he worded it a little awkwardly, and perhaps he did too, because in the Q&A he noted that Power Africa is a partnership and stated that the MCC is engaged in their own efforts to promote transparency. His comments formed the title of this post. Paul Hinks of Symbion Power gave an overview of the emergence of his company, which had worked in perilous conditions in Iraq and Afghanistan but is now received by ‘dancing’, ‘cheering’, and ‘hugging and kissing’ from Tanzanians, where there work in Africa has centered to date (funded by MCC nonetheless). Symbion is now expanding to Africa’s largest markets – South Africa and Nigeria. In the Q&A he noted the limitations of renewable energy. He added that Symbion has however, created employment by growing bamboo as a power source. He noted that a 3,000 acre plot creates 1,400 jobs (I believe this is drawn from an example in western Tanzania). I suspect however, that this might make some uneasy (those concerned by land grabs, green agriculture, etc.) and I wonder myself, given how easily bamboo flourishes, how that many jobs can be sustained? I thought it was pretty cool however that Symbion is working with a English Premier League Football club (Sunderland) to establish a soccer academy in Dar-es-Salaam. I left with about 30 minutes to spare. I enjoy Rep. Bass’ breakfasts, and I particularly look forward to one that goes beyond AGOA and Power Africa. I suspect however, that the focus of these events really shows the increasing prominence of US public – private partnerships as a form of US – African engagement.